Depression - not primarily in the meaning of our everyday language, but in the clinical sense - is one of the great sufferings of modern life. While mood swings are a normal part of life, depression is a serious disorder that limits the quality of life and suppresses the immune systems. Depression has been on a steady rise worldwide since the early twentieth century. People suffer from feelings of dejection, low self-esteem, become lethargic and lose interest in what is going on around them. They find it difficult to get motivated, and the consequent reduction of productivity reinforces their perception of inadequacy and insufficiency, and let them feel trapped in a downward spiral. Depression - in the clinical sense - is an illness that infiltrates your whole body. It affects the way you feel about things, situations and persons, and the way you feel about yourself; it affects the way you eat and sleep, and how your memory is working. Depression, as a mental disease, is going along with body processes, or vice versa. Depression cannot just be blown away, it have to get treated. You need the help of specialists, and then you can start helping yourself. Ayurveda mentions Depression as Vishada. This is also described as “most disease aggravating factor”. Although this disease is categorized under psychological diseases, it can also affect the body; hence it can lead to any physical or psychological disorder. imbalance in Kapha and Vata Doshas along with aggravation of Tamas and lack of Sattva quality of mind. Shodhana - Purification - Depending on the type of Dosha aggravation, specific purificatory procedures should be followed. Shamana - Pacification - Use of Herbs, Yoga , Pranayama and Sattavavajaya chikitsa - achara rasayana. Prof. Dr. Subhash Ranade & Prof. Norbert Lotz, Ph. D. are the two experts in Ayurveda and Cognitive psychotherapy. 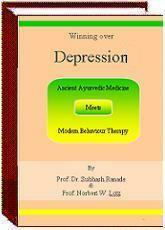 Together they have successfully compiled this complete and comprehensive ebook on Management of Depression. The authors, Prof. Dr. Subhash Ranade & Prof. Norbert Lotz, are two well-known specialists in the field of two theory- and practice-proven systems and methods: the Ayurvedic Medicine and the Cognitive Behavior Therapy. They know each other since twenty years and now put their knowledge and experience together to write the first book about treating depression by a combination of Ayurveda and Behavior Therapy. The book is a scientifically based, rather compact and highly readable compilation of backgrounds, approaches and case studies. What causes a person to become depressed?